All about the people behind the industry at each stage of the process required to make pharmaceuticals coming together to exchange information and find new contacts with whom to do business. Making Pharmaceuticals Europe puts exhibitors at the centre of everything. The highly successful formula for the UK will be refreshed for the European market at the Brussels Expo, Belgium. Stand sizes are limited to promote fair and equitable participation, stands larger than 27 square metres will need special permission up to a maximum of 36 square meters. 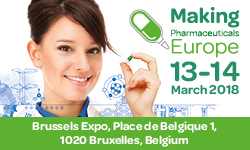 Visit www.makingpharma.eu to find out more.